The U.S. has 78 GW of hydropower – that supplied about 63 percent of all the power from renewable sources last year. 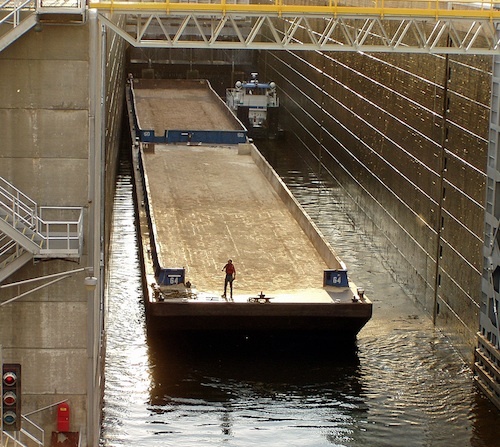 But there are also 80,000 navigation locks, dams and high river flows that could be utilized to generate electricity. The Ohio River and the Mississippi River are especially rich in this untapped renewable resource. In a new report, An Assessment of Energy Potential at Non-Powered Dams in the United States, the Department of Energy estimates that if some of these were to be equipped now with hydroelectric power generation, they could generate an estimated 12 GW, increasing hydropower capacity by roughly 15 percent. They looked at the most promising 54,391 of the 80,000 NPDs (Non-Powered Dams), and found that nearly all of the untapped hydroelectric potential is concentrated in just 100 sites. These ones alone could contribute approximately 8 GW of the 12 GW potential. The greatest amount of hydropower potential is found in Alabama, Arkansas, Illinois, Kentucky, Pennsylvania, Texas, and Louisiana, mainly due to a series of locks and high river flows on the Ohio River. The study was funded by the Office of Energy Efficiency and Renewable Energy and produced by Oak Ridge National Laboratory in partnership with Idaho National Laboratory. The study is one of a number of nationwide resource assessments being conducted by the Energy Department to assess how U.S. hydropower capacity can be expanded. An exhaustive three year investigation by the Bureau of Reclamation of the potential in municipal waterways and canals has uncovered much less encouraging untapped potential of just 260 MW nationwide, or only the size of one power plant. But, with the 12 GW (12,000 MW) of NPD potential capacity, together with the untapped potential of wave, tidal and river energy just emerging, the DOE estimates that all forms of hydropower could generate 15 percent of the nation’s electricity by 2030. Hydropower is one of the oldest renewable energy technologies, with the first hydroelectric project built at Niagara Falls in 1879, well before we understood environmental protection. That has given hydropower a bad name. We could do it right this time, with what we know now, as part of developing our marine energy potential.